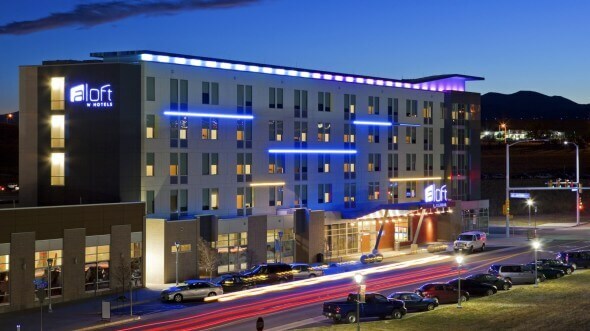 Located in northwest Denver suburbs, the 139-room Aloft Broomfield Denver is a contemporary Colorado hotel with hip, almost 70s-cool décor, with a lively atmosphere. Located between Denver and Boulder, it is a business traveler sleep tank during the week, catering to leisure guests on the weekend due to its primo location near Broomfield Event Center. 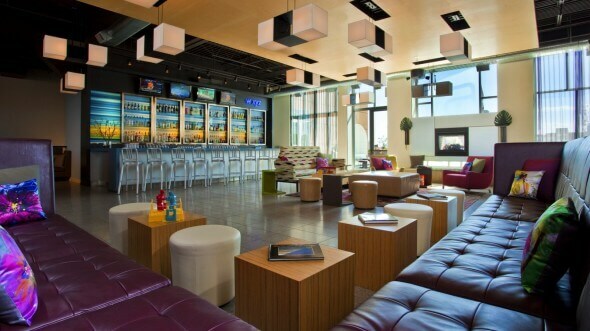 The Aloft Broomfield Denver is located between Boulder and Denver. A last minute booking brought us to the Aloft Broomfield Denver on a snowy Saturday late afternoon. Although my husband and I are both familiar with the area, it is off-the beaten path (east of Wadsworth and south of I-36), although on a well-marked, stop-lighted street, in a up-and-coming neighborhood, Arista. The hotel sits amdist a group of apartments and walkable to the Children’s Hospital and the Broomfield Event Center. Our Saturday night stay came with a warning that the Roller Derby at the Broomfield Event Center usually makes it a late night at the hotel. Due to the weather, however, the event was cancelled. Park for free and then enter the hotel from the east side. In the midst of the large, open lobby features a curved reception desk directly ahead, to the right a lowered lobby bar and relaxed sofas, chairs and tables for seating. The far right has a relaxed game room to hang out with friends too. Check-in was effortless, and the staff exceptionally friendly. Both elevators are located just off the lobby, and the first one that opened appeared to be a service elevator, although I later discovered both were the same. 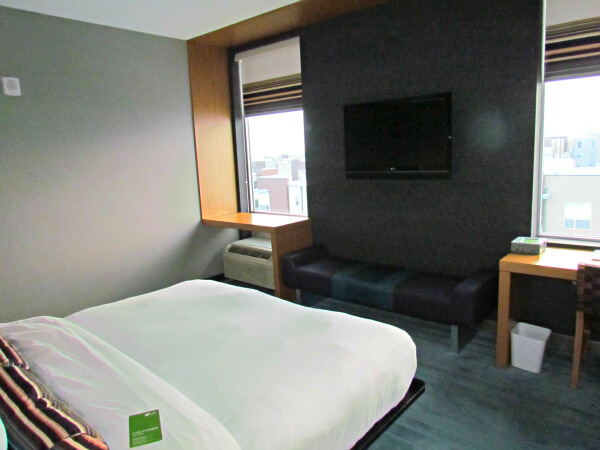 The Aloft Broomfield Denver features large, airy rooms. Upon entry the bathroom is divided from the sleeping area by a wall, and the lavatory offers a sink and storage area separate from the toilet and walk-in shower. Our 4th floor room was bright with 9-foot ceilings, larger than average at nearly 300 square feet. Our signature king bed was made for sleep and centered in the “bedroom” with a view through the extra large windows. The heavy business traveler traffic is evident with the large desk sits in front of one of the oversized windows, with free hotel-wide wired and Wi-Fi access and a connectivity station to recharge gadgets and link to the 42”LCD flat screen. Since we hadn’t had dinner, we freshened up and then made our way back to the lobby bar, the xyz(SM) bar. As mentioned, the sunken lobby is home to the bar, and the neony lights from behind the bar again reminded me of the 70s. A handful of people were seated at the bar, but the surrounding sofas and chairs were empty. But not for long as within 20 minutes the surrounding residents arrived with their dogs in tow. I have not seen so many pets at the same time – literally about a dozen dogs (up to 40 lbs) gathered around the lobby furniture, some sans leash. I’m a dog-lover, so I had no problem, but for those not in tune with canines, it’s good to know. We discovered quickly that the weekend food choices were extremely limited at the bar, while the Monday-Friday menu was a bit more extensive to include hamburgers. The only appealing menu items (to us) were chicken tenders and Thai chicken wraps, and obviously they were pre-made as they came out within 5 minutes. We had to ask for plates and silverware, surprisingly given small cocktail napkins plastic fork and knife. Another bartender (Clare) noticed our silverware and came over quickly to apologize and offer us “real” silverware and a larger cloth napkin. The food was edible, but really tasteless, and later that evening, we actually ordered pizza delivery. Also in the lobby, behind the reception desk, is a 24/7 pantry with coffee, sodas, and light snacks. Bring your swimsuit to take a dip into the indoor pool, conveniently off the lobby and near the elevators. There’s also a 24/7 gym, an advantage to those with unusual work schedules. There’s also a large outdoor patio off the sunken lobby bar. With its convenient location to several local businesses (Interlocken Business Park, Sisco, ball Aerospace, etc. 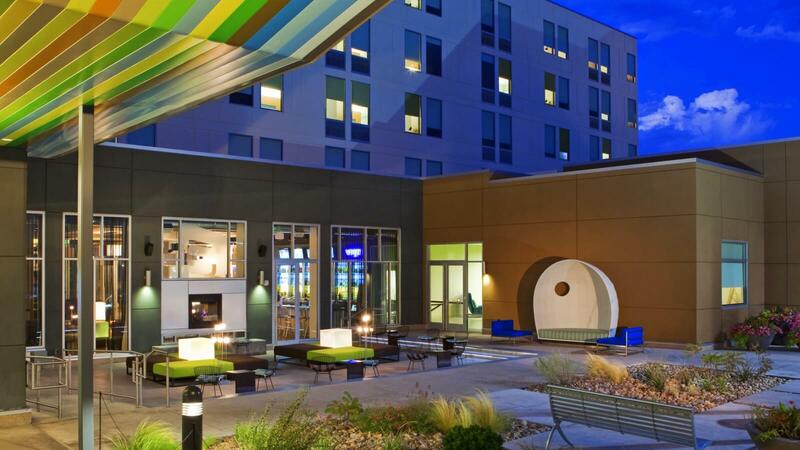 ), I can see why this budget-friendly Aloft Broomfield Denver is popular with north Denver business travelers. The business vibe is fed by the free Wi-Fi and the convenient amenities. The location is perfect for those wanting to take in a show at the Broomfield Event Center, have a few drinks and not drive. The staff is accessible and friendly (with the exception of the odd experience with our first bartender), and even offered us the pizza delivery menu.However, the abbreviated menu, unleashed pets and lively local crowd on the weekends might be a deal-breaker for weekend guests. Book your room through the hotel website, Priceline or Hotels.com.